What is Multi-Categories Rule in xshippingpro? Xshippingpro matches rule categories with cart categories one by one during checkout. So it never permit a category that are not listed under rule categories. But often one product could be assigned to more than categories. To work properly, you should enter all categories of a product to the rule categories list although it is not comfortable to enter each category for a single products. Multi-Categories Rule can help in this case. You don’t need to put every categories of a product to the rule category list. Instead you can select only one of them, and choose Multi-Categories Rule to “Any” that will do affect same thing as entering all categories to rule category list. 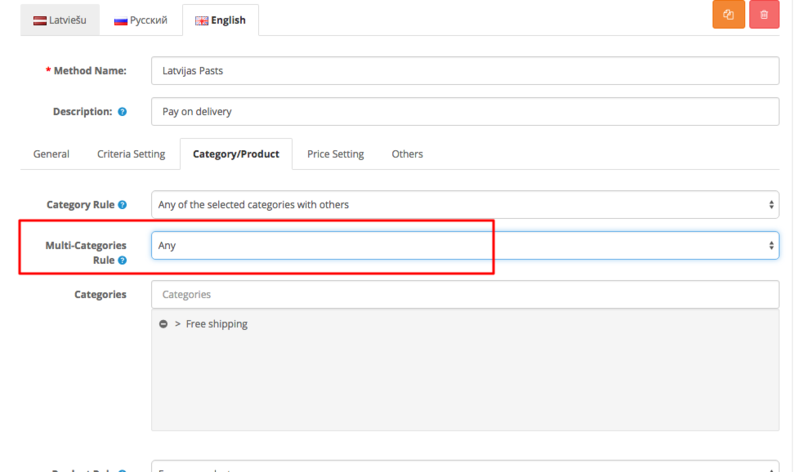 For example, you have a product which was assigned to category A, Category B and Category C. By default, you will have to select category A, Category B and Category C under xshippingpro category rule. But if you choose Multi-Categories Rule to “Any“, then it is enough to choose category A only under xshippingpro category rule to work properly. It will be same thing as choosing category A, Category B and Category C.
Multi-Categories Rule will help to save your time a bit. This entry was posted in Modules, Trick & Tips, Xshippingpro on January 9, 2016 by samir. Now go to Category/Product tab. Select category rule is “Any of the selected products”. Now select applicable products. That’s all. It is very easy, isn’t it? This entry was posted in Modules, Trick & Tips, Xshippingpro on January 7, 2016 by samir. For each method you can define multiple ranges e.g weight ranges or quantity ranges and a separate cost for that range. select rate type is “Quantity”. Then you will have to enter following unit ranges. Finally you will have to select final price to cumulative. why cumulative? Because you want to sum up two ranges cost together. Q. So what will be shipping cost for 5 items from above scenario? Q. What is Per Unit Block? for second unit range (second row) for our described shipping scenario. Q. What is Allow Partial? select rate type is “weight”. Then you will have to enter following unit ranges. Since we don’t need summed cost of each rows together in this scenario. So final cost will be single NOT cumulative. So what will be cost of 2.5kg? Total block 2.5, cost of each block $5 so cost is $15 (3*5, 2.5 rounds to 3 depending on Allow Partial) (according to first row). This entry was posted in Modules, Trick & Tips, Xshippingpro on January 6, 2016 by samir.